PM Netanyahu says at Yom Yerushayim event that Washington has increased funding for Israel's missile defense program after Trump visit. 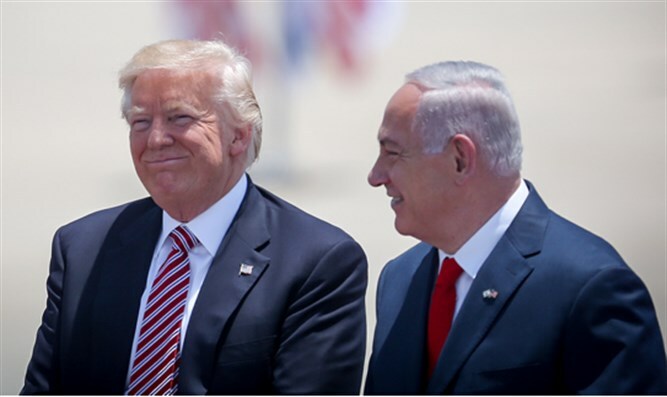 Prime Minister Binyamin Netanyahu said Washington has added tens of millions of dollars in extra defense aid for Israel, a day after US President Donald Trump wound up a visit. He did not say over what timeframe the money would be disbursed. The addition comes on the heels of a weekend announcement of a massive US-Saudi arms deal. Under a 2016 agreement, Washington already bankrolls its Israeli ally's military spending to the tune of $3.8 billion dollars annually over 10 years, making the Jewish state on of the top recipient of US assistance. "Three days ago, the US added another $75 million to the aid package for the missile defense program," Netanyahu said at a memorial ceremony for Israel's dead in the 1967 Six-Day War. Israel's total defense budget amounts to some $16 billion, excluding the US aid. Washington announced a $110-billion US sale of ships, tanks and the latest anti-missile systems to Saudi Arabia on Saturday as Trump began a two-day visit to the Gulf state before travelling on to Israel. Phased over a 10-year period, US administration officials say it is the biggest single arms deal in American history. In the first public comment by an Israeli official, Defense Minister Avigdor Lieberman said Wednesday he was uneasy over the deal, calling it part of a "crazy" regional arms race. "I'm not at peace with any arms race and the huge Saudi purchase for sure doesn't add much to our peace of mind," he said in an interview with Israeli Army Radio. Nevertheless, Lieberman said, "We are following developments and are aware and have ways of dealing with this." "It's not just the Saudis, its also the Emirates, also the Qataris, also the Iranians; they are all acquiring weapons, he said." "Weapons deals in the Middle East just in 2016 reached $215-216 billion and this is no small sum," Lieberman said. "It needs to be understood that there is a crazy arms race going on, the amount of arms all the players in the region are acquiring and the desire to produce weapons in places like Yemen and Lebanon." The White House said that in talks with Netanyahu in Jerusalem on Monday, "President Trump underscored the United States' ironclad commitment to Israel's security, including to the maintenance of Israel's qualitative military edge." The thrust of the deal with Riyadh aims to help the Saudi military bolster its defenses to deter bitter rival Iran and its missile program, which Netanyahu has said potentially poses an existential threat to the Jewish state.